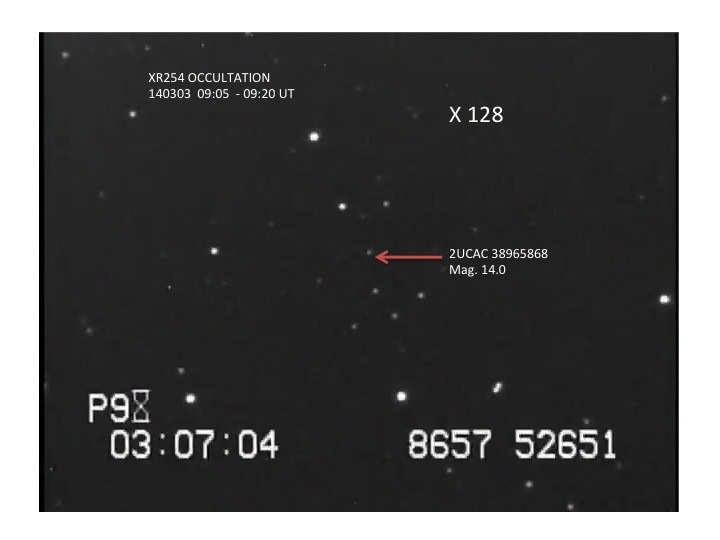 Kuiper Belt Object 2001 XR254 will occult 2UCAC 38965868 on 2014 March 3 from 09:05 – 09:20 UT (Monday, March 3, 1:05-1:20 AM Pacific Standard Time). The star has a reported magnitude of 14.0. 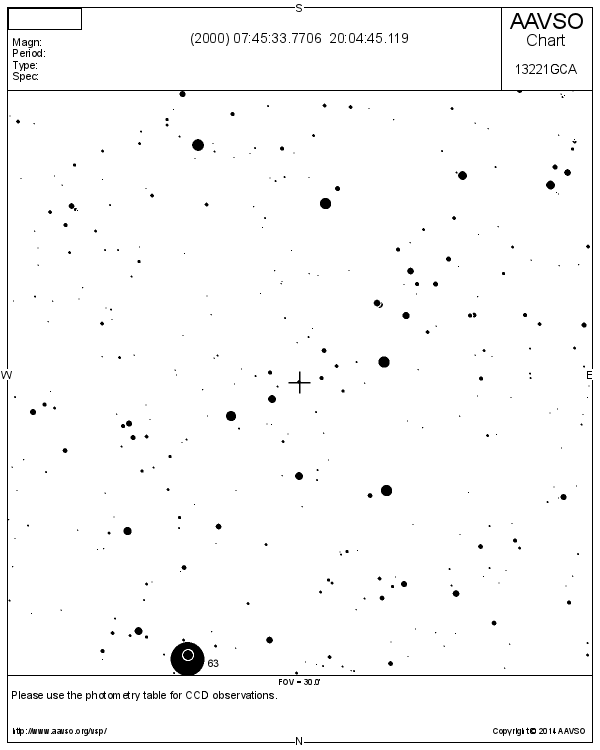 The star’s position is RA: 07:45:33.8 DEC: +20:04:45, J2000. The moon is nearly new and will not be up. Use a sense up setting of x128 for this event. This event represents our second attempt at an actual Kuiper Belt Object (Pluto was our first KBO target last May). There are high uncertainties in the orbital track of this roughly 200km object, but this will be the case for several of our KBO attempts. 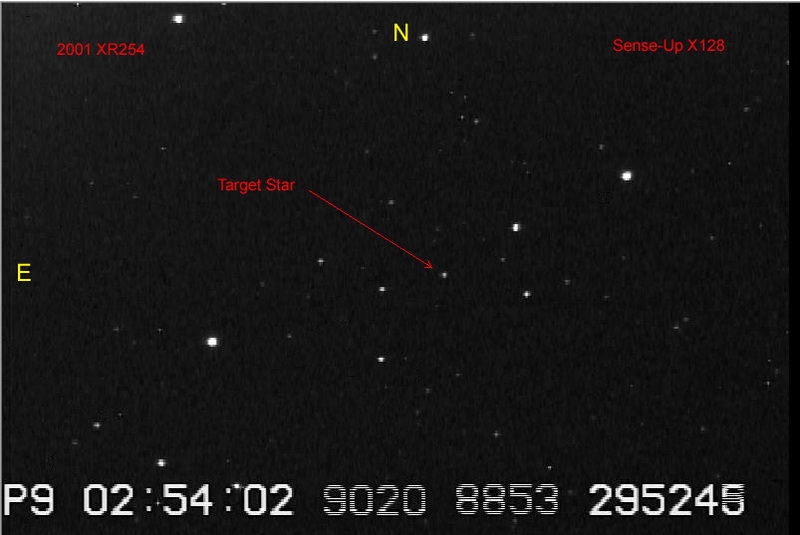 Another challenge with the event are that the target star is fainter than we have gone before (magnitude 14). The entire network is within 1-sigma of the predicted path, so if we are successful in detecting this object, it would a huge success for the project. The chart below shows the predicted path of 2001 XR254 . Because it takes the Mallincam time to stabilize after changing sense-up settings, we would would like those observing to be on the field and change the sense-up time to x128 by 09:00 UT (01:00 AM PST), 5 minutes before starting to record the event. This will give the camera time to stabilize before recording data. RECON sites should start recording at 09:05 UT (01:05 AM PST) and capture three 5-minute video segments up until 09:20 UT (01:20 AM PST). That is, teams should capture video from 1:05-1:10AM, 1:10-1:15AM, and 1:15-1:20AM. Below is a very nice annotated starfield image taken by Jerry Bardecker in Garndernville. And another nice image taken by Bill Gimple in Greenville.